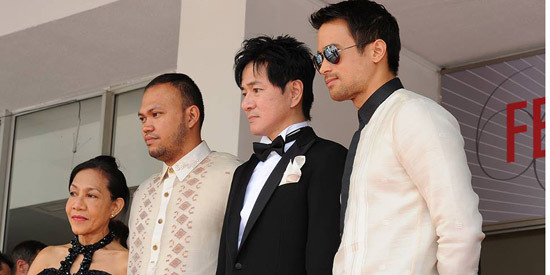 Sam Milby was part of the Philippine delegation that represented Death March at the the 66th Cannes Film Festival. The Filipino actor graced the world premiere of Death March, which was included in the Un Certain Regard section. For the May 19 screening, Sam wore a Barong Tagalog designed by Francis Libiran when he walked the red carpet. Joining Sam on the red carpet were director Adolf Alix Jr., producer/actor Jacky Woo, and supervising producer Evelyn Vargas-Knaebel. This war drama also stars Sid Lucero, Zanjoe Marudo, Jason Abalos, Carlo Aquino, and Felix Roco. However, they were unable to attend the prestigious event. Death March tackles the torturous march endured by American and Filipino prisoners of war as they were forced by the Japanese Army to walk for 128 kilometers during World War II. The film was shot in a studio filled with hand-painted backdrops. In his official Twitter account, Sam expressed his excitement for sharing the spotlight with a famous director and the lead stars of the Hunger Games franchise. Last May 18, the ABS-CBN actor posted: "Just finished walking the red carpet here at Cannes Film Festival. Kasabay namin si Steven Spielberg, Jennifer Lawrence & Liam Hemsworth!" In the official website of Cannes, director Adolf explained why he chose to do a film about one of World War II's darkest chapters. He was quoted as saying, "When I was young, my grandfather told me stories about the Second World War and the Bataan Death March. It was very interesting and heartbreaking to hear about the struggles of the soldiers in order to survive the ordeal. It stuck with me and after dealing with madness and isolation in my previous films: Liberation [and] Kalayaan, it was fitting to close the trilogy with Death March, since it offers a perspective on the psychological effects of such an event on those involved. What is inside the minds of these soldiers." Todd McCarthy of The Hollywood Reporter noted that Direk Adolf "can be theoretically admired for trying something different but the repetitiveness and tedium soon take over." Justin Chang of Variety had this to say about the Pinoy film: "Deploying a curious mix of artificial scenery, extended slow-motion and black-and-white cinematography, the director seeks to suspend viewers in the surreal, barbaric experience of the Bataan Death March..."
He also observed that the "actors show an impressive intensity of commitment." OTHER PINOY FILMS IN CANNES. Aside from Death March, Lav Diaz's Norte, Hangganan Ng Kasaysayan is also included in the Un Certain Regard section of Cannes. Meanwhile, Erik Matti's OTJ (On the Job) is included in the Directors' Fortnight of Cannes. It stars Piolo Pascual and Gerald Anderson. Sam shared a photo of him with Gerald and Rayver Cruz through his Instagram account. Sam disclosed in his caption that his fellow Star magic talents arrived in France just as he was about to go back to the Philippines.